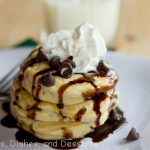 Chocolate Chip Banana Pancakes – light and fluffy banana pancakes with lots of chocolate chips. 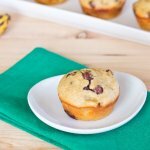 Great to use up those bananas on your counter! When we go out for breakfast it is pretty much a given that my husband and son are going to have pancakes with whatever they get to eat. 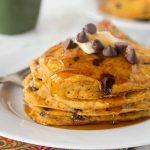 My son is partial to chocolate chip pancakes or Pumpkin Pancakes depending on the time of year. And I am pretty sure if given the chance, he would eat pancakes every day for breakfast. There is just something about homemade pancakes though. They are light and fluffy and a great start to a weekend for sure. I like to customize them by adding in chocolate chips for my son, topping them with fresh berries for my or real maple syrup for my husband. 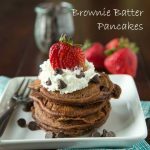 Even with something better for your like Protein Pancakes, you can still make them so everyone in your family will enjoy them. 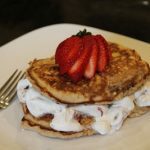 Banana pancakes might be my new favorite way to use up those bananas on the counter. In the past it was Blueberry Banana Bread, but these pancakes just might take over. They take homemade pancakes to a whole new level. And turning them into chocolate chip cakes makes them even better. 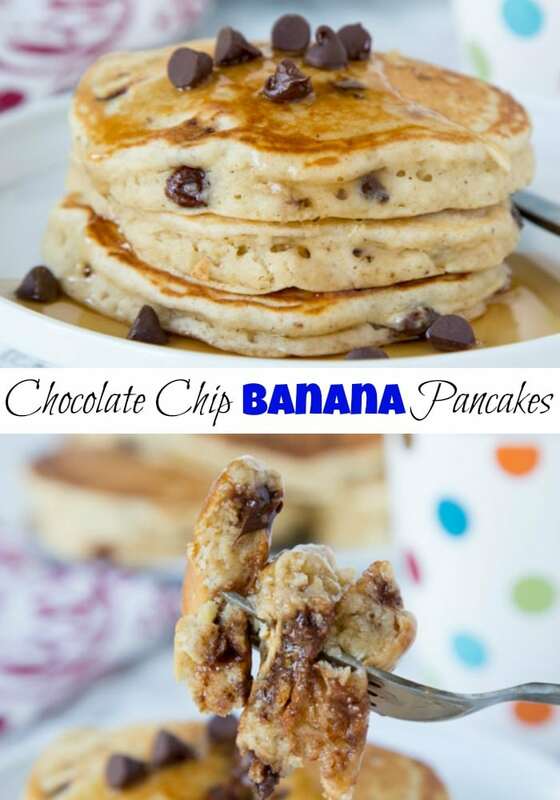 One question I get asked a lot is how do you add chocolate chips to pancakes. I have 2 methods I use, and they both work well, it just depends on what you are doing. Mix in the chocolate chips with the flour and dry ingredients. This way they mixed evenly in your batter and don’t just sink to the bottom of your pancakes. I use this method if I am making a full batch of chocolate chip pancakes. 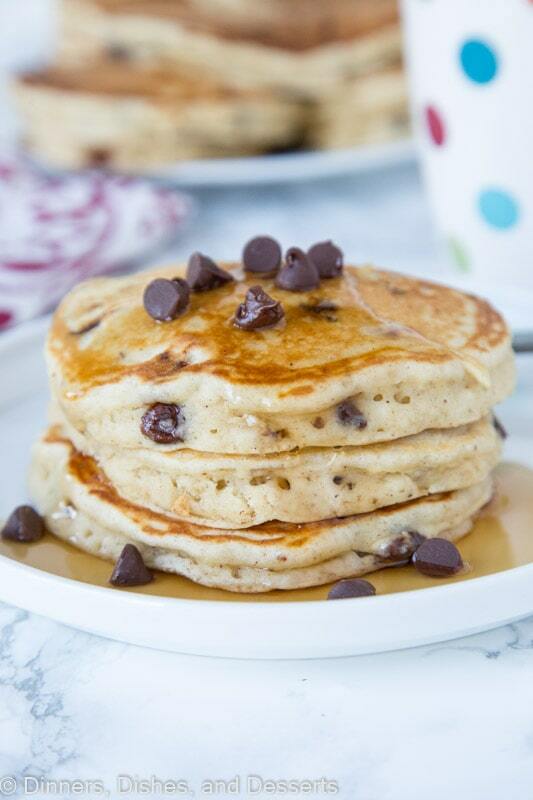 After you pour the batter onto the hot griddle or skillet, sprinkle a few chocolate chips onto the pancake. 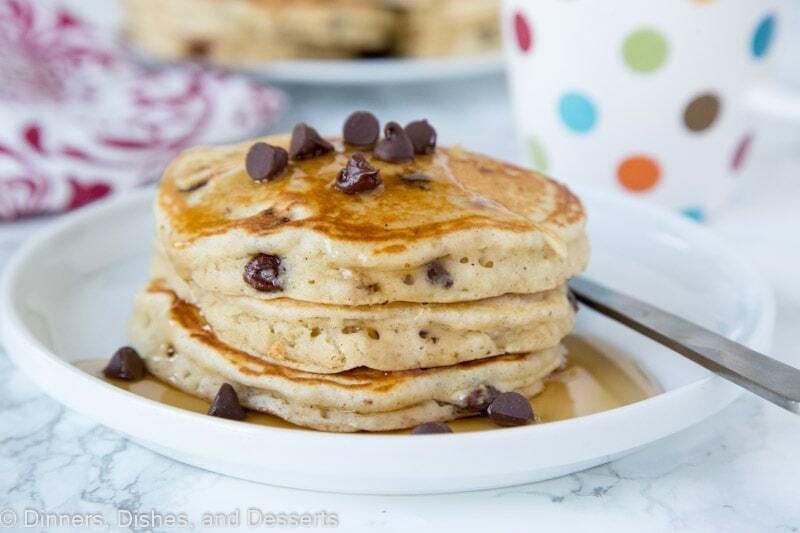 This method is great if you just want a few pancakes with chocolate chips in them. The chocolate chips sit where you put them and tend to stay on the bottom of the pancake, but it still works well. Pancakes are very simple to make. You start by mixing all of the dry ingredients together; the flour, baking powder, sugar etc. Then you just mix the wet ingredients; the egg, milk, mashed banana etc. Combine them together and you are pretty much done! You really don’t want to over mix them, so once everything is blended you want to start cooking. 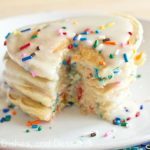 The baking powder starts to react with the liquid right away, so pancake batter is not something that you want to make ahead of time, or your pancakes will not turn out. Over the years I have learned a few tricks to make the perfect light and fluffy pancakes. They are super simple, and anyone can do them, you just have to follow the rules. Mix the batter until just combined. Do not over mix or your pancakes will be tough and not fluffy. Buttermilk really does help make the best pancakes. 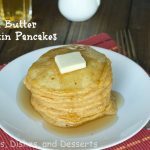 You can use another type of milk if that is all you have, but pancakes are the time to grab that little container of buttermilk and it on hand. You can mix in 1 tsp of vinegar with your milk to have a homemade version of buttermilk. When you flip your pancakes don’t touch them! So many times when people flip pancakes they use the spatula to press down on the batter. Resist the urge. You will watch the pancake slightly puff up, and this is what you want! The air bubbles are forming and they help make the fluffiest pancakes! Cook on a high heat. Pancakes cook quickly, they are thin. So you don’t want a low heat or they will not get that golden brown color. Homemade pancakes may be a few minutes extra work than the mix, but they are so worth it. The pancakes taste so much better and they come out light and fluffy every time. 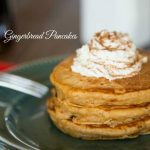 The next time you have bananas sitting on your counter, these banana pancakes are definitely the way to go! Weekends with pancakes or Monkey Bread or any kind of indulgent breakfast is definitely the way to go! I like to lay and leftover pancakes out on a baking sheet in a single layer. Then I put them in the freezer until they are frozen. After that take all the pancakes and put them in a freezer safe bag. 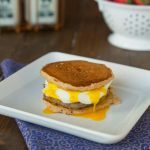 Busy mornings you can just take out a couple pancakes and microwave them for a quick and easy breakfast! Or if you have lots of over ripe bananas make cake! Hummingbird Cake is a delicious dessert for those extra bananas. 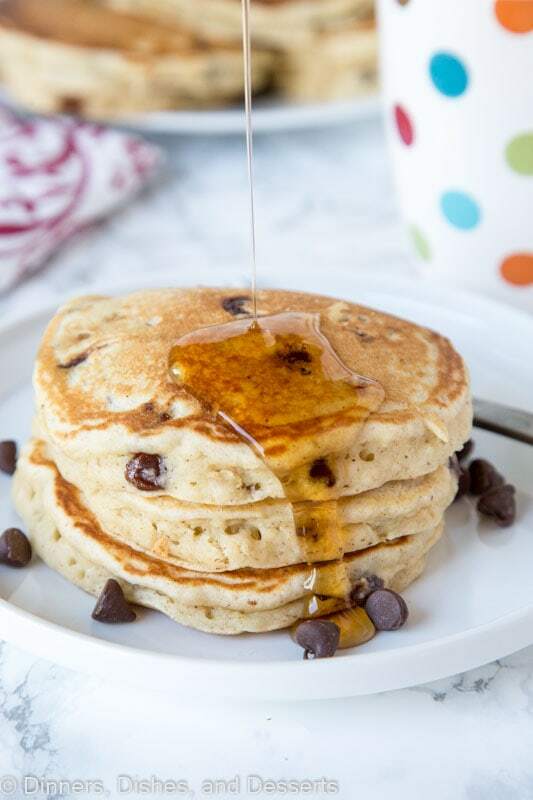 Chocolate Chip Banana Pancakes - light and fluffy banana pancakes with lots of chocolate chips. Great to use up those bananas on your counter! 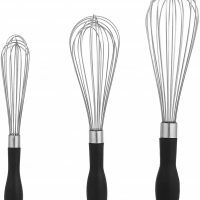 In a large bowl whisk together flour, both sugars, baking powder, salt and cinnamon. Mix in chocolate chips. Set aside. In another bowl mix together mashed bananas, egg, milk, butter and vanilla until well blended and smooth. Add banana mixture to flour mixture and stir until just combined. 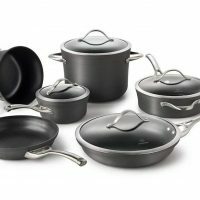 Heat a large skillet or griddle to high heat, about 350 degrees. Spray with non-stick spray or coat with butter. Scoop about 1/4 cup of batter onto the hot surface. One bubbles form over the top of the pancake batter, flip. Cook for about 3-4 minutes per side. 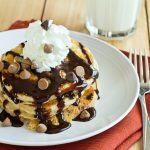 I love me some homemade chocolate chip pancakes -this recipe looks perfect! Fluffy pancakes are the only pancakes my family will eat! 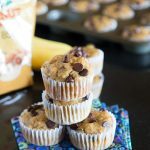 These are tasty and perfect for the weekend! YUM!! 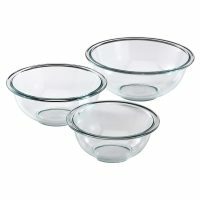 My family would LOVE these! Okay this is amazing! Thank you so much! 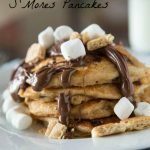 My husband would love these pancakes! Pinning them for later. Thanks! These should be tops on the brunch checklist! They are so fluffy!! Great recipe! I think this will be one of my favorites. Looks incredible! 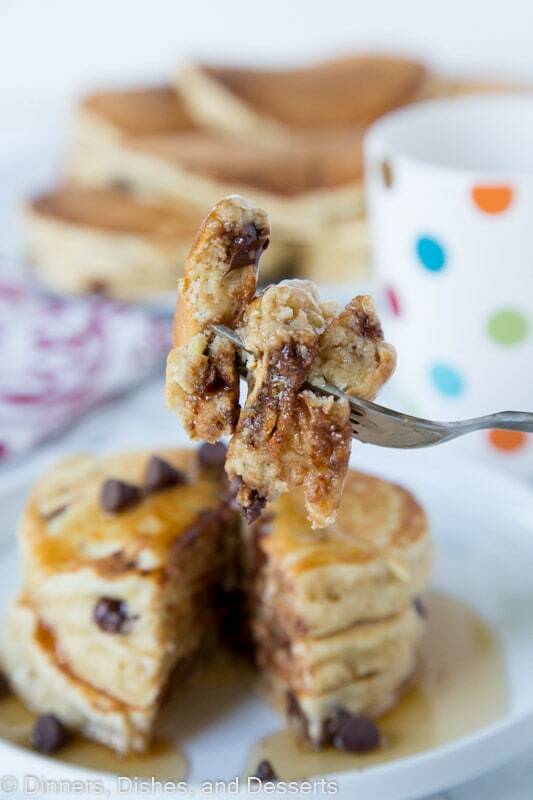 These pancakes need to happen! 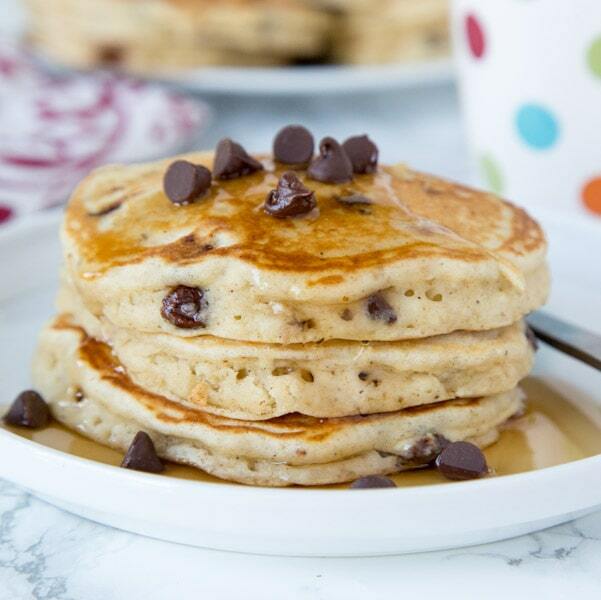 I love that you add chocolate chips! Just made them and they are delicious, so fluffy! Just one little thing,I noticed in the recipe instructions nowhere is the egg mentioned, if you would like to change that. Sorry, I corrected that – thanks for pointing it out So glad you enjoyed them!